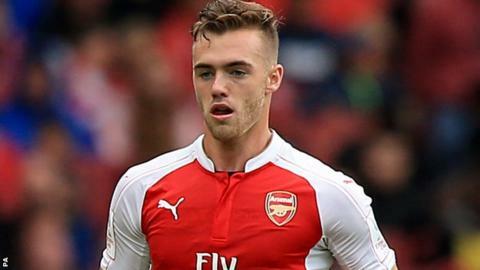 Arsenal have been fined £60,000 and warned about their future conduct by the Football Association after breaching football agents regulations over the transfer of Calum Chambers. The FA described the incident as "fronting", where an unauthorised and unlicensed agent is involved. Arsenal say they "acted in good faith" and that the FA recognised they had "no intention to mislead". The defender joined from Southampton for about £16m in July 2014. Authorised agent Alan Middleton has been fined £30,000 and suspended for three months for his role in the matter. In a statement, the FA said: "Arsenal admitted part of the breach but denied another, which was found not proven following an Independent Regulatory Commission. "The charges against Mr Middleton, which he denied, were found proven." A statement from Arsenal read: "We acted in good faith throughout in this transfer and had no reason to believe that the player's representative was not authorised to be involved in the transfer negotiations. "The FA fully recognised that there was no intention to mislead on Arsenal's part. "We have improved our procedures to prevent this happening again."